I am trying to insert items from a form into MSSQL via PHP but I am having some trouble, please see my code bellow and see if you can point me in the right direction as to my trouble. And I thank you in advance. Thank you in advance let me know if you need more info. Just a "swag" guess, but try omitting the last comma. i did make that change to the script tho. it could be because of use of "thing" instead of using 'thing' maybe? "to avoid escapingg you could also use single quotes ' instead of double quotes ". Then PHP does not resolve variables within the string. (see this question)"
I don't think the quotes are an issue here. Take a moment to learn how quotes work in PHP, then please post the complete script exactly as you have it now, thanks. Also, have you considered using MySQL instead of sqlsrv? If there is a reason why you would reject MySQL, it might be worth discussing. MySQL is about 1,000 times more widely used than sqlsrv, so it's easier to find good examples and competent help. A quick lifetime search of E-E finds 727 answers about sqlsrv, and over 100,000 about MySQL. 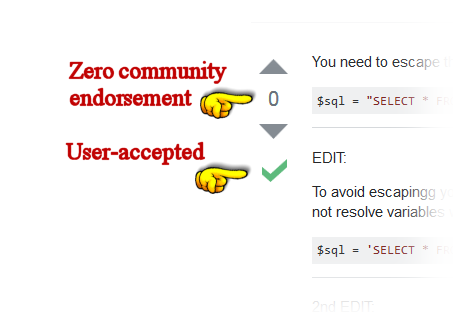 And to the issue of good examples, when you go to StackOverflow with elementary questions, such as "why is my query broken" you probably want to noodle around the site a bit, using succinct keywords to search. When you get to the more popular questions and answers, you're much more likely to find something worthwhile! If you're looking at the question and answers and you're seeing low numbers, it means the question and the answers are marginally useful at best. It's probably wise to stay away from things like that.